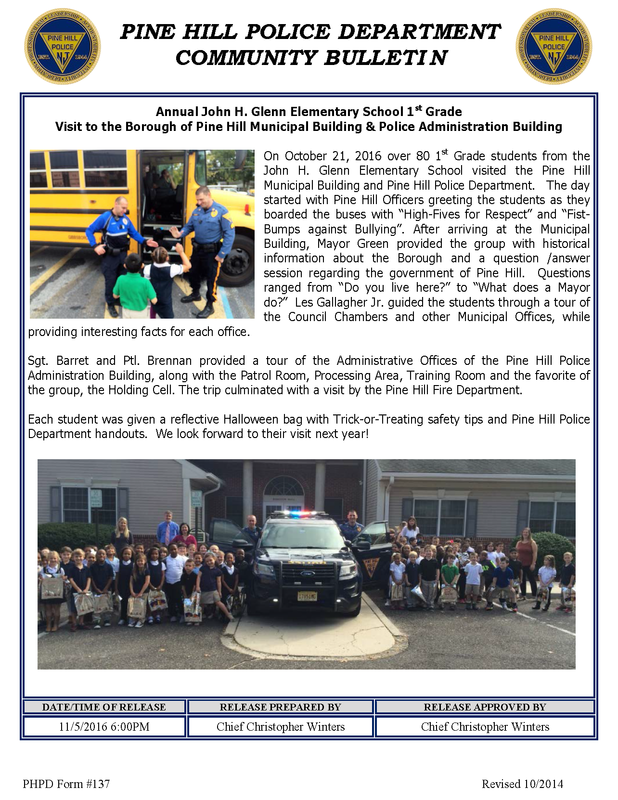 On October 21, 2016 over 80 1st Grade students from the John H. Glenn Elementary School visited the Pine Hill Municipal Building and Pine Hill Police Department. The day started with Pine Hill Officers greeting the students as they boarded the buses with “High-Fives for Respect” and “Fist-Bumps against Bullying”. After arriving at the Municipal Building, Mayor Green provided the group with historical information about the Borough and a question /answer session regarding the government of Pine Hill. Questions ranged from “Do you live here?” to “What does a Mayor do?” Les Gallagher Jr. guided the students through a tour of the Council Chambers and other Municipal Offices, while providing interesting facts for each office. Sgt. Barret and Ptl. 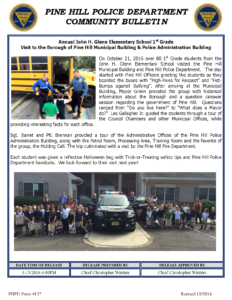 Brennan provided a tour of the Administrative Offices of the Pine Hill Police Administration Building, along with the Patrol Room, Processing Area, Training Room and the favorite of the group, the Holding Cell. The trip culminated with a visit by the Pine Hill Fire Department.